Ten Apples Up On Top By Dr. Seuss. 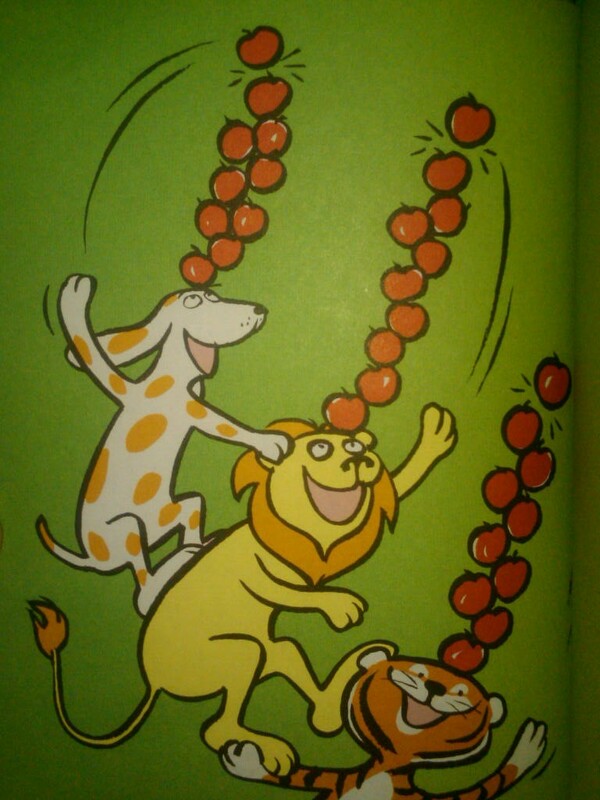 The simple premise of the children’s book, Ten Apples Up On Top, starts with a lion balancing an apple on his head, just to see if he can do it. His friends join in and soon they are stacking more and more apples on their heads and doing stunts while chanting “We can’t let them drop.” While they are playing, an angry bear tries to knock their apples off their heads with a mop. The indication is that the mob that begins chasing them does not want them playing their game because they can’t do it and it annoys them. Riley loves Dr. Seuss as I’m sure most of us do. Ten Apples Up on Top has become a fast favorite as she’s learning to count higher numbers. She loves for me to read the book as fast as I can. As I’ve been reading it to her over the past few weeks, the little wheels in my head relate it to my work day. What starts as a simple, enjoyable game, becomes competitive. The competition is not only between the other animals but also breaking their personal best. I can’t stop. I can’t fail and I definitely can’t drop anything. There’s my to-do list, my child, keeping up with the house and the bills. Oh and occasionally I have to eat. At one point in the book, the tiger is walking on a power line like a tight rope with 7 apples on his head. How many days in a week do you feel like you are walking a tight rope in a huge hurry? Maybe not with 7 apples on your head, but I’m sure the swarm of thoughts in your head and the length of your to-do list is comparable. Then there is the negativity chasing me. Others didn’t want me to branch out from a “secure” corporate job and start a service based company. They don’t want me to branch out from my successful transcription company and write a book, offer coaching services or be innovative. In the end of Ten Apples Up On Top, the mob chasing the 3 original animals run into a huge cart of apples 9 times the size of a horse. All the animals end up with Ten apples on their heads, and find that it is a fun game to play. All the other animals had to do was change their perspective. It wasn’t hurting anything for their friends to try something new. When others break through from “I don’t understand this” to “I’ll give it a try”, they are enlightened to a whole new world of possibilities. How often could you teach someone a new technique or method rather than arguing with them (and giving into their negativity)? Do you remember what made the “game” you’re playing fun when you started out? P.S. A side note: Many people don’t know about Ten Apples Up on Top is it was original a political cartoon written under the pen name Theo. LeSieg. (Dr. Seuss is also a pen name for writer Theodor Seuss Geisel in case you didn’t know.) Seuss was very pro-WWII. He drew many political cartoons against isolationism and denouncing Hilter and Mussolini. Seuss was trying to get people to look at the situation from another point of view. So get what you are talking about here! Love the idea of teaching rather than arguing. Just the insight I needed to today. Thanks! Thanks Andrea. I was just trying to remind myself of this again this morning. I often find that when my 3 year old and I have confrontations it’s because I haven’t explained to her what we are doing or that we are in a hurry. So glad I’ve finally got around to reading this post. Everyone’s got their own stuff going on and making a decision to change things followed by *acting* on that decision is for but a few. Please *do* branch out and be innovative when the time is right for you! Treadmills and negativity aren’t what it’s all about! You’ve clearly got some great ideas and the attitude to go with them. Thanks for your comments! I think it’s very easy to get into the “can’t see the forest for the trees” mentality and it’s always great to take a step back to see the bigger picture.